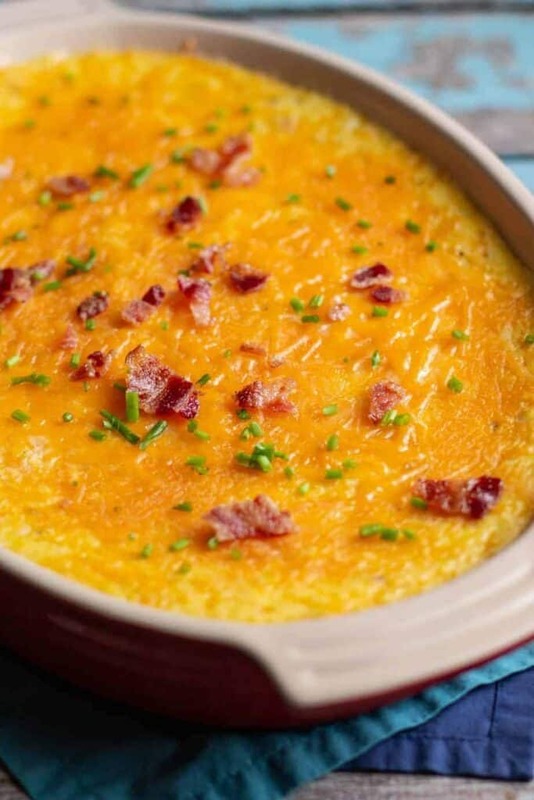 These cheesy baked grits are a great breakfast or brunch dish. 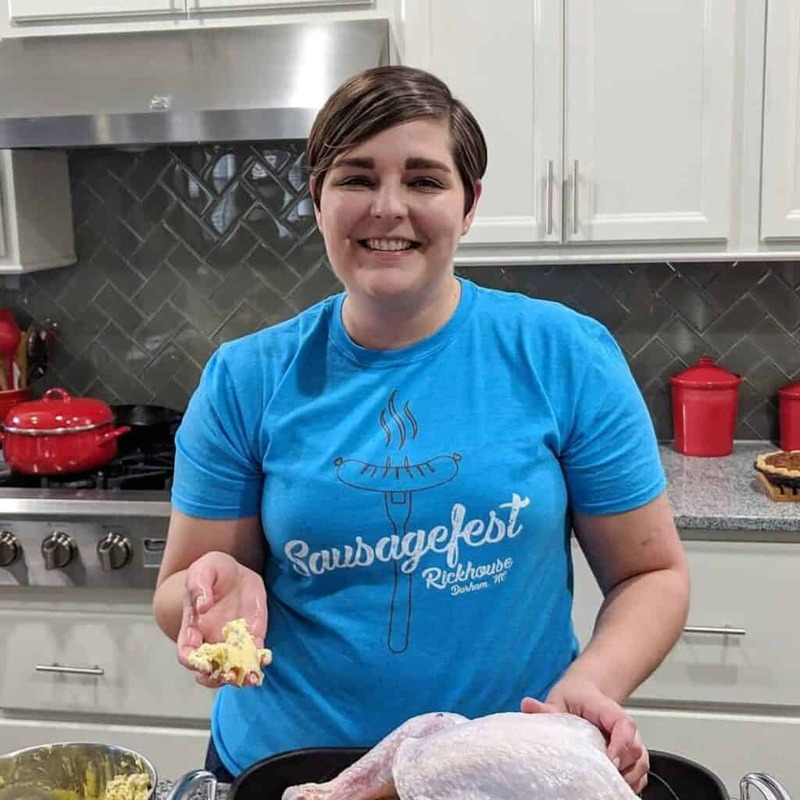 They can feed a crowd and can even be made ahead of time. Just do everything up until the point of baking, let the grits cool a bit, and stash them in the fridge until morning. 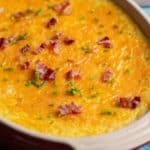 I first made these cheesy baked grits well before moving to North Carolina. Though now that I live in the South, I felt the need to give them a facelift. The original recipe was pretty straightforward: cheese + grits (and seasonings, of course). The new and improved version has salty bacon and oniony chives. Add whatever mix-ins your heart desires, though. You can’t go wrong. Need other breakfast recipes? Check out my Sweet Potato Waffles with Candied Pecans and Pressure Cooker Steel Cut Oats for a couple of other ideas. OR! Take a peek at these Make-Ahead Cinnamon Rolls. Preheat the oven to 350 degrees F. Grease a 4-quart casserole dish and set aside. Cook the bacon until crisp and roughly chop. Set aside. Bring the broth, salt, pepper, and garlic powder to a boil in a sauce pan. While whisking continuously, add the grits to the sauce pan. Whisk until the grits are completely combined. Reduce the heat to low and simmer until the grits have thickened. Add the shredded gouda and cheddar, along with the milk, and stir. Gradually stir in the beaten eggs and butter until combined. Add the chopped bacon and minced chives and mix until they are evenly distributed throughout. Pour the grits into the prepared casserole dish, smoothing the top with a spatula. Sprinkle the remaining shredded cheese over the top. Bake for 30-40 minutes, or until the grits are set. Allow the grits to cool for 15 minutes or so (or longer) to allow them to firm up a bit. I have to confess I have never cooked grits. With this recipe, I will change that! @Lynda – TasteFoodHi Lynda! I hadn't made grits prior to trying this recipe. It's really easy. Enjoy, and thanks for stopping by! 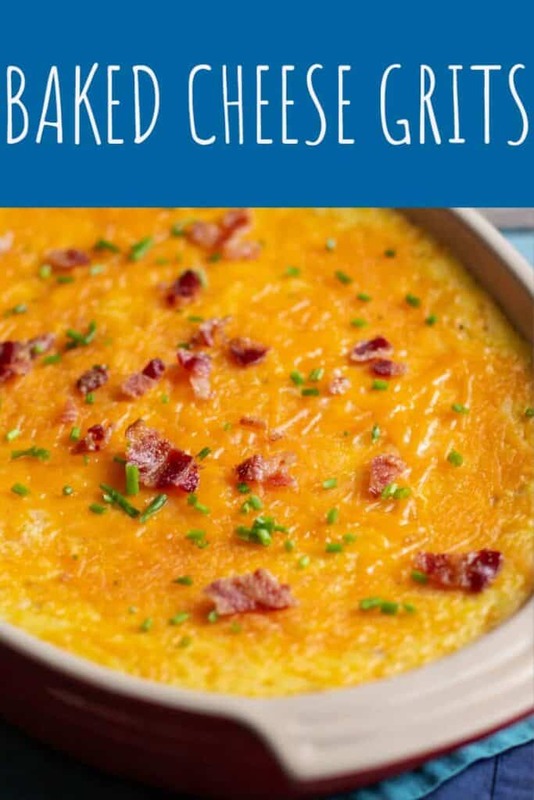 This looks great–I was just saying I've never had savory grits (only for breakfast with maple syrup-silly northerners) so this is getting added to my list.